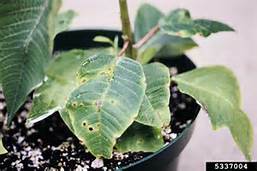 Poinsettia scab is a disease caused by the fungus Sphaceloma poinsettiae. It is a problem for greenhouse poinsettia growers in Florida and Central America and is quickly spreading to other regions. Some Euphorbia weed species are also hosts of the disease. It has been in Hawaii for many years. 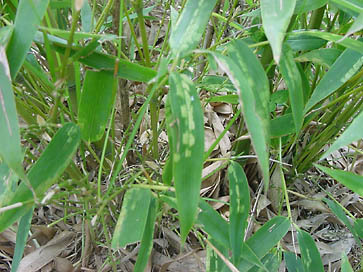 The disease affects both the leaves and stems; small, round lesions form on the leaves. These spots develop whitish to brown centers, have a dark red to purple rim, and often show a yellow halo. Occasionally, an infected stem will grow six inches or more above the rest of the plants. This is due to the production of growth regulating chemicals called gibberellins, produced by the fungus. The disease thrives in high humidity and wet growing conditions. Splashing water will easily spread the spores from leaf to leaf and plant to plant. The key in controlling this disease is to stop the spread of the spores. When frequent rains occur, a cover over the plant or plants is one solution. Another approach would be to apply a protective copper fungicide that would prevent the splashed spores from starting new infections. Infected plants will usually continue to live. However, the severity of the disease is dependent upon the amount of rainfall. 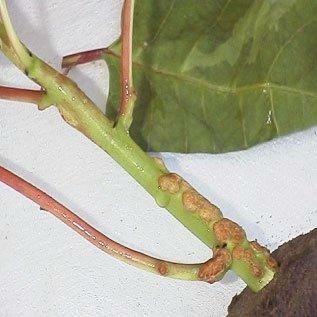 Remove infected leaves, and if appropriate, prune out infected stems. Then apply either a copper fungicide or one with the active ingredient chlorothalonil (Bravo, Daconil). As new leaves emerge, reapply the fungicide. In the future, if the disease is not severe, removing infected leaves may keep the disease under control. The bamboo spider mite is a common pest of bamboo and will occasionally attack rice and sugar cane. Mite damage can potentially lower the bamboo's aesthetic and economic value. 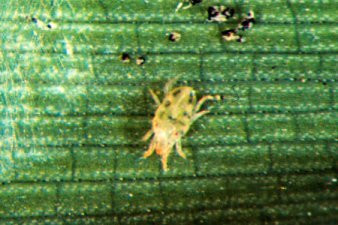 The mites have a flattened body, which is straw-colored to greenish yellow with small blackish green spots. Mite feeding will result in chlorotic (pale yellow) areas on the upper leaf surface. On the underside of the leaf, mite colonies will be found under tightly woven webbing. Generally the mites remain under the web to feed and lay eggs. A couple of miticides, Avid and Floramite, are registered in Hawaii and are quite effective. Silicon-based surfactants such as Silwet and Silgard are recommended for use with Floramite. Before buying any of the above products, however, try spraying with a soap solution or a commercial product like Safer Soap. They usually do a good job. Make sure to spray the undersides of the leaves, good coverage is important. Come back in seven to ten days for one or more repeat applications.